Can we drive in the field in a more sustainable way – and can it pay off? The most important task of a machinery station is to offer agriculture the most optimal and sustainable solution through the latest technology, so that the agricultural business, regardless of its size, can have access to the latest technology. This issue will be the pivotal point when Danske Maskinstationer og Entreprenører, DM&E, opens the doors to the conference ”MEKANI 2025” that takes place in December. The scenic Vingsted Centre provides the setting for MEKANI 2025, where consultants, researchers, machinery manufacturers and practitioners will give inspiration through new ideas on how the machinery stations can invest in technology that is sustainable for the soil. Known solutions include “dog-walk” steering, controlled traffic farming (CTF), where heavy machinery runs in permanent traffic lanes, and manure spreaders that are supplied with manure through a feeding hose. The question is what to invest in the future. What will agriculture demand and pay for? Should machinery run on wheels or tracks? These are just some of the issues that will be raised at the conference. According to Mogens Kjeldal, this requires investments of DKK 1.5 to 5 million in each unit, and there is no room for bad investments. As something of a novelty, the conference is open to a wider audience because the need for new solutions is best developed jointly by machinery stations, researchers, consultants and manufacturers. The conference takes place on 7 December at the Vingsted Centre. 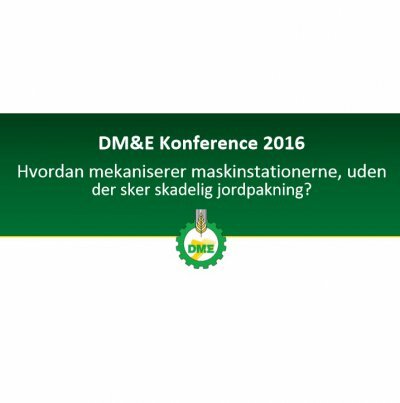 Check the programme and register for the conference through the website of DM&E www.dmoge.dk. Please note that the number of places is limited.